"I stopped at a deli and ordered a meal that came with this salad. The salad was so different that I didn't even want to try it. I did try it and loved it! I created my own version at home. Everyone loves it! You can use spinach leaves entirely if you prefer, or mix in any kind of greens you like." Make a dressing by whisking together the mayonnaise, sugar, and vinegar in a small bowl. Stir in the poppy seeds; set aside. Toss together the lettuce, spinach, and onion in a large bowl. Drizzle the dressing over the salad and toss to coat. Add the strawberries and lightly toss again. Serve immediately. Unbelievable! I did add some reduced fat feta and some walnutes and substituted mayo for light mayo. Loved everyhting about it and still felt it was light enough to be a healthy option! This is a great recipe, even for a non-salad lover like myself. I add mandarin oranges along with the strawberries, and it really adds a nice touch, too. This is a house favorite! fantastic! I could not find rasberry vin, so i bought rasberry balsamic and added a pint of crushed rasberries. Everyone loved it! 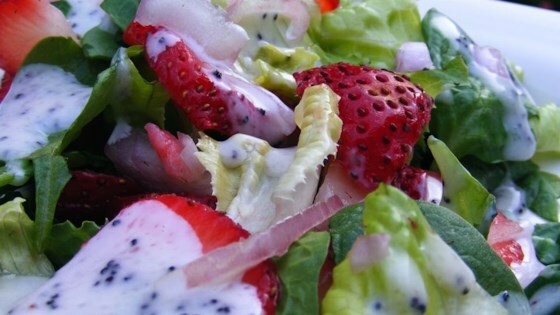 I have been making a recipe similar to this for years - Yumm - I Love strawberry salad ! !